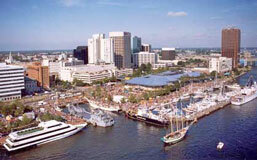 Norfolk Botanical Garden is located at 6700 Azalea Garden Road, next to Norfolk International Airport. Find your way with this map. Open daily 9-7 in spring and summer; 9-5 the rest of the year. Admission fee. Norfolk Botanical Garden is a large and beautiful retreat from the everyday world. 155 acres of gardens are surrounded on three sides by Lake Whitehurst, and water plays an important part in the scenery throughout the gardens. Canals divide the garden into three major sections and provide the boat tour (additional charge). Several water features and fountains add attractive sounds and movement. Mirror Lake and Friendship Pond complete the watery milieu. You'll get a garden map at the entrance. There are miles of trails through the gardens and without a map you might miss something good. 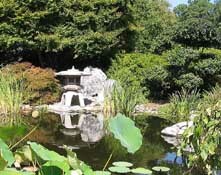 The excellent Japanese garden and the Turner sculpture garden are especially easy to miss if you don't know where to look. Don't be put off by the miles of trails. The Critter Crawler tram is available for free narrated tours. Or take the boat tour. Or by sticking to the central gardens you can reduce the amount of walking. The gardens are for everyone, regardless of physical capabilities. I visited on a sunny Sunday in late September. I didn't expect to see a lot of blooms in early autumn, but I was pleasantly surprised ... the gardens had plenty of color even in this "off" time of year. 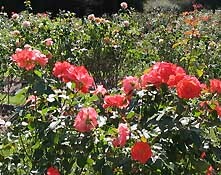 The big 3.5 acre rose garden (3,000 rose bushes of 430 varieties) near the parking lot really puts on a show in autumn. See what's in bloom now. The many "signature gardens" include perennial, camellia, stauary, butterfly, flowering arboretum, and native plants. Climb to the top of the NATO Tower for a birds-eye view of the area. Hungry or thirsty? The surprisingly good cafe overlooks the Japanese Garden, near the visitor center. Tasty sandwiches and salads are made from quality ingredients. 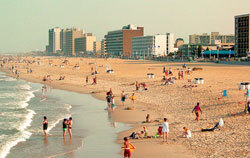 They also serve a wide variety of beverages, including beer and wine. If the weather is good, enjoy a break outside on the terrace. Keep your eyes open for ideas for your own yard and gardens. Many of the plants are labeled ... choose your favorites, then visit your favorite nursery and buy them for home. Fountains give sound and movement to the Norfolk Botanical Garden. Roses are at peak bloom in October. Don't miss the Japanese garden. 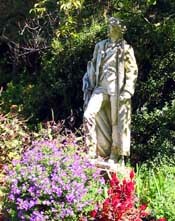 The Statuary Vista has marble statues of great Europeon artists.